Founder and CEO Ken Gardner opened with thanks to the many people who worked to make conDati Marketing Analytics possible: the original four-person team who founded the company on June 1, 2017; the nearly 30 employees who have joined since then; our investors; and the alpha and beta customers who have worked with us to create a powerful and market-ready solution. Dan Bartow, VP Product Design, gave a live demonstration of conDati Marketing Analytics. Then Mauricio Acevedo, Director of Digital Marketing for Pepperdine University, showed how Pepperdine has used conDati Marketing Analytics to create a unified data asset and escape spreadsheet hell — and adopt a new approach to understanding digital campaign performance that is faster, more complete, more accurate, and less expensive than old-style manual reporting. conDati’s Chief Data Scientist John Zicker then took the stage to show what else conDati Marketing Analytics can do once it has created a unified data asset for marketing. Zicker began with Westworld: a cultural reference to AI that we’re all familiar with. However, contrary to what Lisa Joy and the other creators of Westworld would have you believe, AI isn’t (not yet at least) as much “artificial intelligence” as it is “augmented intelligence”. In other words, the data science driving conDati Marketing Analytics helps skilled, talented marketing professionals with the heavy lifting in their day-to-day jobs. It allows them to focus on marketing, shaving days off their work-weeks that had been dedicated to blending, analyzing, and formatting data into reports that, once completed, were nearly always obsolete—only to start the next round. On top of this, of course, is that this brute, rote task of gathering data is best left to the “augmented intelligence” of machines for another reason: the threat of human error is real. conDati Marketing Analytics also forecasts long-term revenue trends. This ability is a game-changing strategic advantage marketing professionals need in order to make informed decisions about future campaigns. Perhaps conDati Marketing Analytics’ real value comes when marketing teams provide their expert knowledge about competition, pricing, known demand signals, holidays and other seasonal effects. 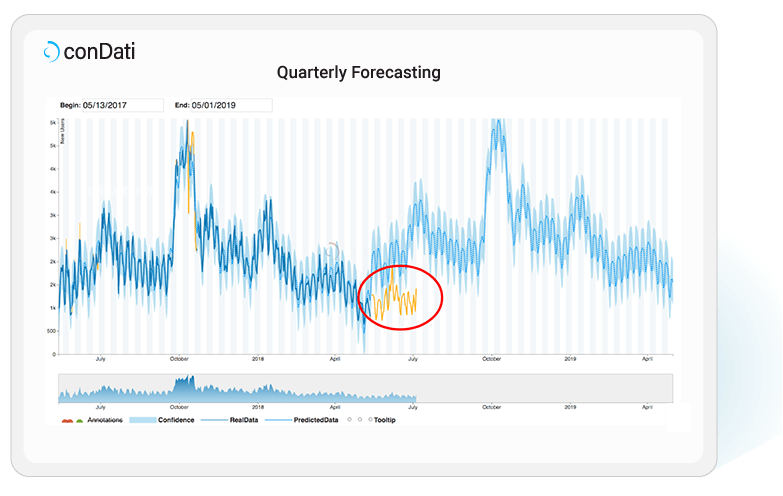 conDati Marketing Analytics learns the parameters of each component and applies that insight to give an informed view into seasonal trends, anomaly alerts and forecasting that allows our customers to make intelligent decisions about their future campaigns. When marketing teams can see data points that clearly show something “out of the ordinary” range, they can then act on this knowledge, putting the locus of control for marketing ROI firmly with the marketing team. 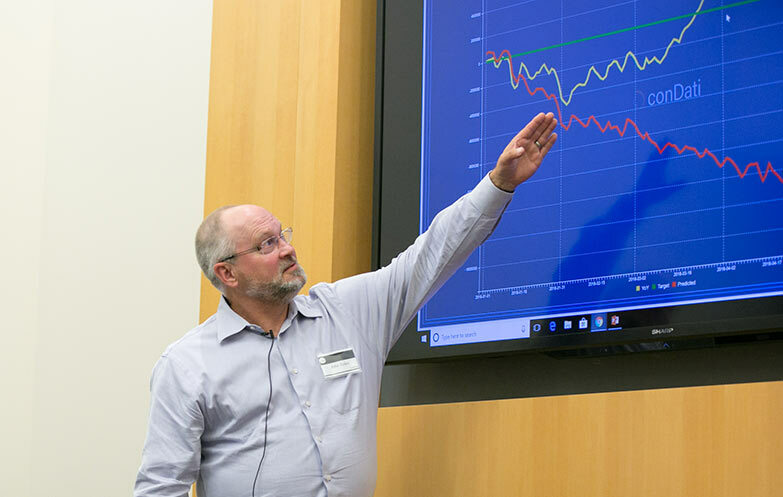 John Miller, Chief Technology Officer at Discount Dance Supply, the largest online retailer for dance apparel, presented his experience transforming Discount Dance Supply’s marketing using conDati Marketing Analytics. The holistic view conDati Marketing Analytics gives eliminates surprises while reducing digital marketing costs, saving elapsed time and reducing the possibility of human error. With over 50,000 keywords to track, up to 10M emails sent per month, and a reliance on “too many data sources”, Miller described the challenge to become more effective and efficient. As early adopters of digital advertising, Discount Dance Supply began in the early 1990s with a $500 campaign. That spend has grown to several million, with CPC costs rising 400% over the past nine years and competitors’ sophistication levels rising along with those costs. 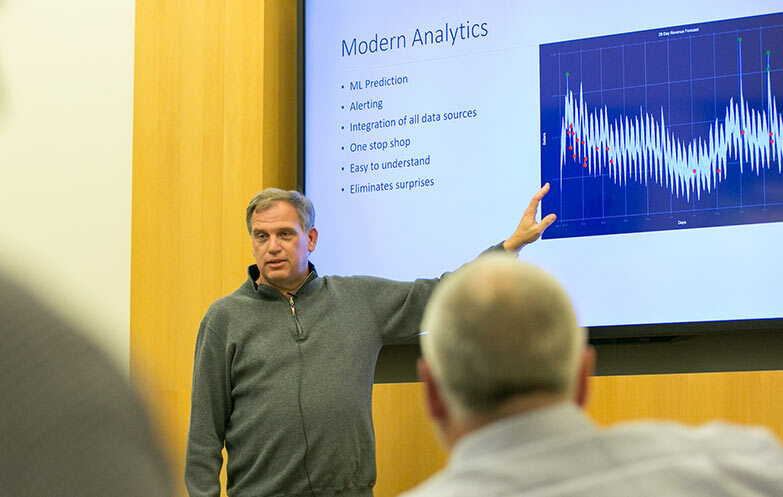 conDati Marketing Analytics provides Miller with a “one stop shop” integrating his data sources, eliminating surprises with anomaly alerts and trend forecasting, and providing an easy-to-understand view of all his marketing campaigns. By recognizing trends quickly, Discount Dance Supply has the ability to act on events that arise during their marketing campaigns — taking control of their destiny, rather than wondering what worked and what didn’t. At the end of the day, as Miller says, “conDati provides a central resource for our multiple data sources and programs so that we can easily look at a heatmap or a dashboard and see what’s going on without having to go into multiple platforms.” Saving time, money and the potential for human error: a huge win for Discount Dance Supply. Ten years ago, marketing teams needed millions of dollars and days of work to do what conDati Marketing Analytics does in minutes at an affordable price point. Still today, marketing teams spend, in some cases, a full work day each week cobbling together spreadsheets, manually scraping data to produce reports which are late, prone to human error, and often less insightful than necessary. All in an attempt to make good decisions about how to spend their marketing budget. Now, taking advantage of advances in cloud economics combined with leading edge data science, conDati Marketing Analytics provides a frictionless, simple, intuitive and instant solution. Imagine having a complete, current view of how all your marketing campaigns are doing during your morning standup. Welcome to the new era in digital marketing.